Is Your Marketing Modern? 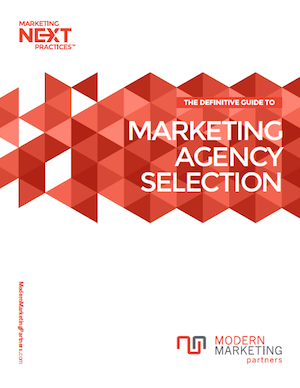 Get a Modern Marketing Report Card! Modern marketing is an evolved mix of strategic marketing, traditional marketing, internet and new media, and better results measurement. Modern marketing is more effective. More cost efficient. More measurable. More targeted. More social and mobile. Is your marketing modern? Modern Marketing Partners is now offering a free modern marketing report card for qualified marketers! Interested marketers can fill out a brief, web-based form and upload marketing samples. The Modern Marketing Partners team will grade submissions by category on a 4-point scale (4.0 = excellent), and provide an overall grade point average (GPA). Also, the report card includes three recommendations for improving grade point average, with the report card emailed to participants in 48-72 hours of submission. For more information, or to make a submission, click here. And in the spirit or modern marketing, and social media, please bookmark and share this blog via the tools below (Facebook, Twitter, Share, Google+).